Precision Navigation Systems, a startup team from Estonia, grabbed the main prize at Fifty Founders Battle! The lucky team is going home with 10 000 EUR from TechChill Foundation and a fast track to the Silicon Vikings Startup World Cup Finals in San Francisco. ZITICITY from Lithuania won a soft commitment of 50 000 EUR investment from a syndicate of 22 LatBAN members, while Adyen and the The Next Web awarded Kipwise (Estonia) with an invitation to the Founders Day and The Next Web conference in Amsterdam. “In the end, it was a close contest between two excellent candidates for the final jury – Precision Navigation Systems and ZITICITY. 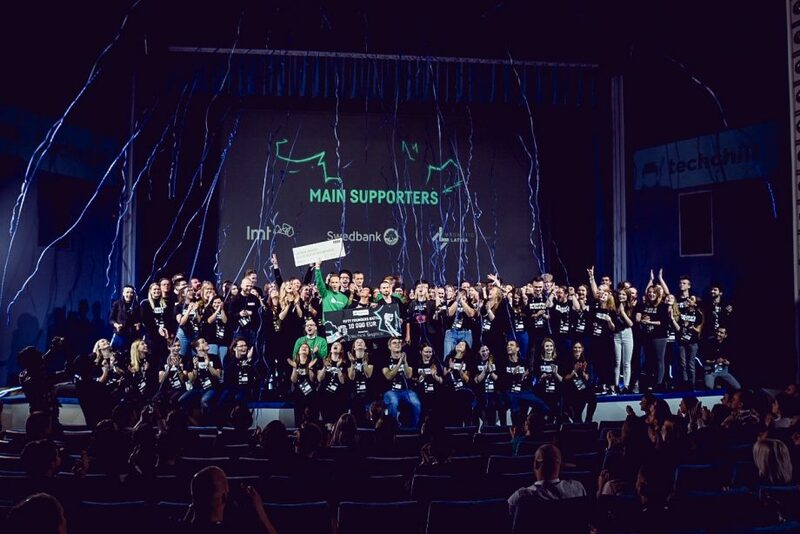 The Estonian team won us over and got the grand prize due to their grand vision of a global technology deployment,” said Andris K. Bērziņš, the co-Founder of TechChill Foundation and the Managing Partner at Change Ventures. The lucky winner of the FIfty Founders Battle – Precision Navigation Systems – received the main prize of 10 000 EUR with no strings attached from the TechChill Foundation, a tradition upheld for the second year in a row. The startup is developing software and hardware solutions for precise GPS positioning and navigation. ZITICITY received a “LatBAN award”, a soft commitment of 50 000 EUR by syndicate of 22 LatBAN members. A soft commitment means that the syndicate will engage in the investment negotiations with the team, and if both parties agree on investment terms, the investment is made. In case if the required investment amount will exceed 50 000 EUR the parties may raise additional funds. The winning startup will also compete against winners of regional competitions from all over the world on May 17, 2019 in San Francisco for a $1 million investment prize. In addition, all European Startup World Cup Finalists will get the opportunity to pitch at the European Continental Finale in Prague for a 500,000 Euro investment prize. Meanwhile, TNW and Adyen extended an invitation to Kipwise to Founders Day & TNW 2019. The Founders day is an exclusive gathering bringing together the founders of the Tech5 (class of 2019), accompanied by Tech5 alumni, global press, and top-tier investors. Founders Day 2019 will be hosted in Amsterdam on May 8th. Additionally, the winner will get free access to TNW 2019 the days after Founders Day. Amazon Web Services provide access to AWS credits (500$) for all fifty semi-finalists, and Seedstars is giving 2 passes to the winner of Fifty Founders Battle to attend Seedstars Global Summit taking place on 5th April in Lausanne, Switzerland. The final jury included industry heavyweights with experience in the region, startup ecosystem representatives and executives. The jury included Marili Merendi from Karma Ventures, Andris K.Berzins from Change Ventures, Donatas Keras from Practica Capital, Indrikis Liepa from Cobalt, Chris Brown from 500 Startups, Alex Karevoll from TechStars, Raph Crouan from Startupbootcamp IoT, Guntars Nemiro from Funderbeam Syndicate, Ansis Spridzans from Funderbeam Syndicate and Sebastian Toupy from The Next Web. Our tradition of hosting a startup competition for the most promising startups from the region goes back eight years, as old as the event itself. Previous winners have a track record of success, and include thriving teams such As Edurio, SprayPrinter, Nordigen and Anatomy Next and exits such as Infogr.am. This year, we introduced a different approach to the competition, narrowing down to five verticals, relevant for the Baltics, Nordics, and CEE: Fintech, SaaS, Hardware & IOT, Impact, and Deep Tech, with individual and specialized jury for each vertical in the semifinals. During the semifinals on Day One, 10 startups from each of the five verticals, fifty altogether, had the opportunity to pitch their ideas on the LMT Founder stage. The seven finalists chosen by the juries to pitch on the main stage on Day Two represent five countries. From the fintech vertical – Hive Identity from Ukraine and Jeff App from Latvia, from software as a service – Ziticity from Lithuania and Kipwise from Estonia, from deep-tech vertical – Precision Navigation System from Estonia, from the impact vertical – Neuroflux from Finland, and from hardware and IoT – PowerUp Fuel Cells OÜ from Estonia. Hive Identity empowers consumers to own, control and protects their identity while solving the ever growing fraud for business. Jeff App is a chatbot that helps you find the best financial products for retail customers. Ziticity is a powerful yet simple to use logistics platform that allows clients to deliver the packages to the client within one hour. Kipwise bot helps to create and search for team knowledge directly via Slack interactions. Precision Navigation Systems is developing software and hardware solutions for precise GPS positioning and navigation. Neuroflex combines, visualizes, and analyzes wastewater pumping station data, reducing the need for manual work. PowerUp Fuel Cells OÜ develops next-generation hydrogen fuel cell electric generators. This year the Fifty Founders Battle received 194 applications, seeing a threefold increase in the countries represented, from 11 in 2018, to 35 in 2019. Most of the applying startups came from the Baltic-Nordic region with Latvia taking the lead, followed by Estonia, Lithuania, and Finland. The Baltic-Nordic region isn’t the only region that is represented this year, we are excited to welcome applications all the way from Nigeria, Tanzania, Lebanon, Ghana, and Argentina. We are already looking forward to the next year and are happy to announce that TechChill 2020 will take its place on February 20-21, 2020.